Aoki, M., Tsuzuki, M. and Sato, N. (2016). Quantitation of Cytochromes b559, b6, and f, and the Core Component of Photosystem I P700 in Cyanobacterial Cells. Bio-protocol 6(21): e1991. DOI: 10.21769/BioProtoc.1991. Cytochrome (Cyt) b559, an important and essential core component of photosystem II in the photosynthetic electron transport system, is a heme-bridged heterodimer protein composed of an alpha subunit (PsbE) and a beta subunit (PsbE), and its reduced form has an absorption maximum in the α-band at 559 nm. 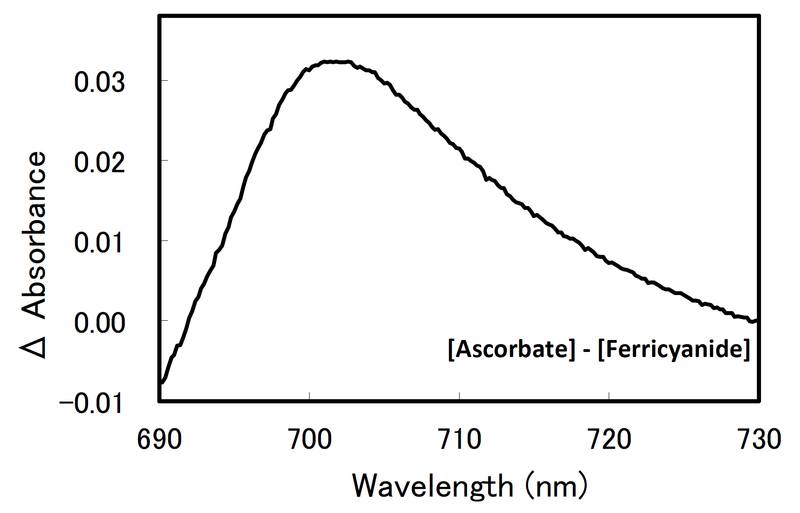 The amounts of Cyt b559 can be determined by spectrophotometrical measurement of reduced minus oxidized difference spectra that are normalized with absorbance of isosbestic point at 580 nm. The authors use differential extinction coefficients of Cyt b559 [Δε(559-580 nm) = 15.5 mM-1·cm-1], which have been reported by Garewal and Wasserman (1974). In addition to the Cyt b559, this procedure can be used for quantitation of Cyt b6 and Cyt f, the subunits of the Cyt b6/f complex, and P700, one of the core components of photosystem I. This protocol, which is adapted from Fujita and Murakami (1987), is used in a cyanobacterium, Synechococcus elongatus PCC 7942, and also in other cyanobacterial strains including Synechocystis sp. PCC 6803. Culture the cyanobacterial cells at 30 °C in 200 ml of BG11 medium, with illumination (10 W m-2) and aeration, to the exponential phase of growth (optical density at 730 nm ca. 0.3 to 0.4). Harvest cells in 4 x 50 ml tubes by centrifuging at 3,000 x g for 5 min at room temperature (Tabletop centrifuge). Discard supernatant by decantation and collect precipitated cells in one of these 50 ml tubes by resuspending them in 50 ml of ice-chilled HN buffer. Repeat the cell-washing step, i.e., centrifugation-resuspension step, twice, with the cells finally resuspended in 3 ml of the same buffer. Transfer the cell suspension into a glass test tube. Work under a dim light on ice for all following steps. Agitate the cell suspension with 2 g of Zirconia/Silica beads by a vortex mixer to disrupt the cells. Agitation for 30 sec at the maximal speed is repeated 4 times with ice-cooling intervals of 60 sec. Transfer the whole cell extracts into a PPCO centrifuge tube. Centrifuge the cell extracts at 3,000 x g for 5 min at 4 °C for removal of cell debris (high speed refrigerated centrifuge). Transfer supernatant into a PPCO centrifuge tube. Centrifuge the supernatant at 30,000 x g for 20 min at 4 °C (high speed refrigerated centrifuge). Discard supernatant by pipetting and resuspend precipitate in 5 ml of pre-chilled HN buffer. Repeat this centrifugation-resuspension step twice, with the precipitate finally resuspended in a small volume (< 0.5 ml) of the same prechilled buffer. Transfer the resuspended membranes sample for cytochromes and P700 measurement into a micro centrifuge tube. Divide the sample into five aliquots to be stored at -80 °C until use. Dilute the sample with 50 mM Tricine buffer (pH 7.5) to a chlorophyll a concentration of 50 to 70 μM (see Note 1). Sonicate the diluted sample twice for 1 sec at 20 W with 10 sec interval on ice to disperse the membranes (Ultrasonic cell disruptor). Transfer 200 µl of the sonicated sample into a micro cuvette. Add 2 µl of 100 mM potassium ferricyanide solution (final concentration 1 mM) to the sample in the micro cuvette and mix it well with a micro spatula. Incubate the sample for several minutes at room temperature to completely oxidize cytochromes and P700. Set the micro cuvette in a spectrophotometer and record the absorbance spectra at the range of wavelengths from 500-750 nm at room temperature. The complete oxidation can be confirmed by observation of no further change in the spectrum (see Note 2). Add a few powder particles of hydroquinone to the sample in the micro cuvette and mix it well with a micro spatula to reduce Cyt f. Record the absorbance spectra at the same range of wavelengths in step 10 at room temperature. Check that Δλ maximum in difference spectra of this step minus step10 is exhibited at 556.5 nm. Repeat step 11 several times until Cyt f is completely reduced, i.e., until the spectrum shows no further change (the final amount of hydroquinone, ca. 0.02 to 0.09 mg) (see Note 2). To reduce Cyt b559 and P700 in the sample, add a few powder particles of sodium ascorbate to the sample in the micro cuvette and mix it well with a micro spatula. Record the absorbance spectra at room temperature. Check that Δλ maximum in Cyt b559 difference spectra of this step minus step 11 is exhibited at 559 nm. Also check that Δλ maximum in P700 difference spectra of this step minus step 10 is exhibited at 700 nm. Repeat step 12 several times until Cyt b559 and P700 are completely reduced, i.e., until the spectrum shows no further change (the final amount of sodium ascorbate, ca. 0.04 to 0.16 mg) (see Note 2). Add a few powder particles of sodium hydrosulfite to the sample in the micro cuvette and mix it well with a micro spatula to reduce Cyt b6. Record the absorbance spectra at room temperature. Check that Δλ maximum in Cyt b6 difference spectra of this step minus step 12 is exhibited at 563 nm. Repeat step 13 several times until Cyt b6 is completely reduced, i.e., until the spectrum shows no further change (the final amount of sodium hydrosulfite, ca. 0.03 to 0.14 mg) (see Note 2). Quantitate Cyt b559, Cyt b6, Cyt f and P700 by using following formulas, , ,  and , respectively (see Note 3). The quantitative results should be presented by mean values ± standard deviations from at least three experiments. Figures 1 and 2 show representative examples of difference spectra with the use of thylakoid membranes of Synechocystis sp. PCC 6803. Figure 1. A difference spectrum of P700 in Synechocystis sp. PCC 6803. The sample included thylakoid membranes equivalent to 60 µM chlorophyll a. Figure 2. 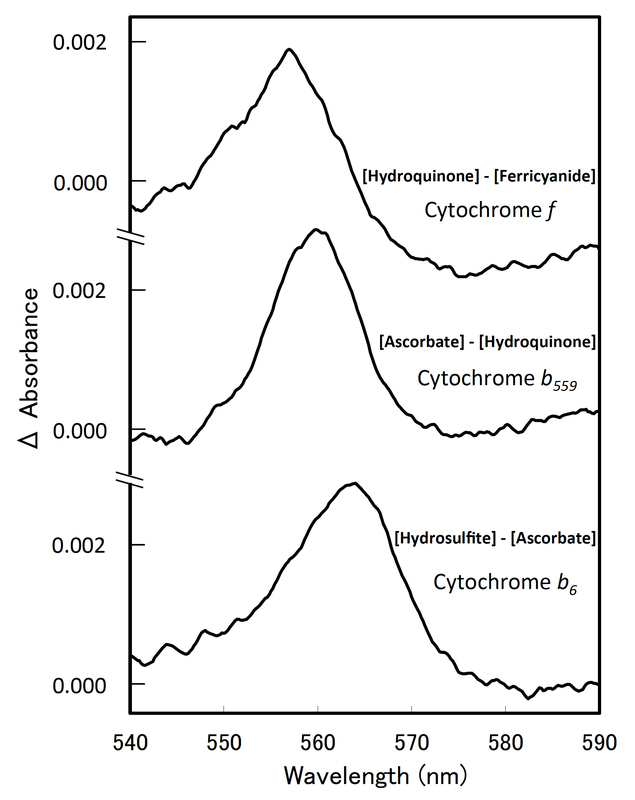 Difference spectra of the cytochromes in Synechocystis sp. PCC 6803. Each sample included thylakoid membranes equivalent to 60 µM chlorophyll a.
Chlorophyll a concentration is determined according to the method of Porra et al. (1989). After extracting chlorophyll a in the membranes sample with 100% methanol, measure the absorbance at 650.0, 665.2 and 730 nm, and calculate the chlorophyll a concentration by using following formula . Be careful to avoid addition of oxidizing or reducing reagents in excess, since it will cause aggregation and/or bleaching of the sample. Differential extinction coefficients used were Δε(700 - 730 nm) = 64 mM-1·cm-1 (P700), Δε(559 - 580 nm) = 15.5 mM-1·cm-1(Cyt b559), Δε(563 - 580 nm) = 14.0 mM-1·cm-1 (Cyt b6), and Δε(556.5 – 544.5 nm) = 21.5 mM-1·cm-1 (Cyt f), which has been reported by Hiyama and Ke (1972), Garewal and Wasserman (1974), Stuart and Wasserman (1973), and Böhme et al. (1980), respectively. We are deeply grateful to Drs. Fujita and Murakami who established this protocol (1987). This work was supported in part by Grants-in-Aid (CREST) from Japan Science and Technology Agency. Böhme, H., Pelzer, B. and Boger, P. (1980). Purification and characterization of cytochrome f-556.5 from the blue-green alga Spirulina platensis. Biochim Biophys Acta 592(3): 528-535. Fujita, Y. and Murakami, A. (1987). Regulation of electron-transport composition in cyanobacterial photosynthetic system-stoichiometry among photosystem-I and photosystem-II complexes and their light-harvesting antennae and cytochrome-b6 cytochrome-f complex. 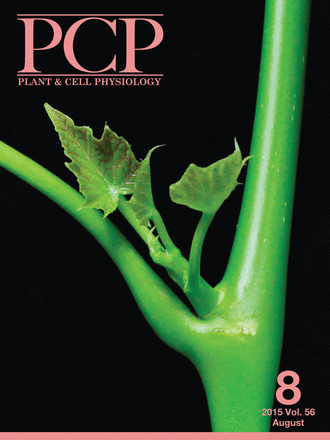 Plant Cell Physiol 28(8): 1547-1553. Garewal, H. S. and Wasserman, A. R. (1974). Triton X-100-4 M urea as an extraction medium for membrane proteins. I. Purification of chloroplast cytochrome b559. Biochemistry 13(20): 4063-4071. Hiyama, T. and Ke, B. (1972). Difference spectra and extinction coefficients of P700. Biochim Biophys Acta 267(1): 160-171. Porra, R. J., Thompson, W. A. and Kriedemann, P. E. (1989). Determination of accurate extinction coefficients and simultaneous-equations for assaying chlorophyll a and b extracted with 4 different solvents - verification of the concentration of chlorophyll standards by atomic-absorption spectroscopy. Biochim Biophys Acta 975(3): 384-394. Rippka, R., Deruelles, J., Waterbury, J. B., Herdman M. and Stainer R. Y. (1979). Generic assignments, strain histories and properties of pure cultures of cyanobacteria. J Gen Microbiol 111(1): 1-61. Stuart, A. L. and Wasserman, A. R. (1973). Purification of cytochrome b6. A tightly bound protein in chloroplast membranes. Biochim Biophys Acta 314(3): 284-297. How to cite: Aoki, M., Tsuzuki, M. and Sato, N. (2016). Quantitation of Cytochromes b559, b6, and f, and the Core Component of Photosystem I P700 in Cyanobacterial Cells. Bio-protocol 6(21): e1991. DOI: 10.21769/BioProtoc.1991.